A new Postcrossing stamp... from Ukraine! Blog > A new Postcrossing stamp... from Ukraine! 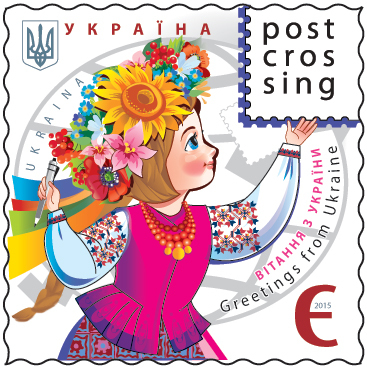 The cheerful stamp was designed by Nataliia Andriichenko, and shows a girl holding a pen, while wearing a traditional Ukranian national costume. A matching cancellation mark and first day cover were also designed, this time featuring a dove, the symbol of peace. It also symbolizes the postal service itself, as a means of international communication and understanding. To celebrate the Ukrainian stamp launch, the Lviv branch of Ukrposhta is planning a postcard exhibition and other events starting at 11am on October 9th, at the House of Scientists (Lystopadovyi Chyn St., 6). Special postcards will be printed on the spot, and will available for sale. Meanwhile, in Kiev, the first day cancellation mark will also be available at the Central Post Office (Khreshchatyk St. 22) throughout the day. Excellent job.. Waiting for this to happen. This Stamp and First day of Issue design is Fantastic! Very well done Natalila Andriichenko and The Postal Services of The Ukraine. I really hope to receive a card from Ukraine with one of these stamps soon! Congrats Ukrainian postal service!!! Enjoy the events Ukrainian postcrossers! This country have a tradition in making lovely stamps. Really beautiful stamp :) Looking forward receive one once it had been released. Love it and already loooking forward to receiving it on beautiful postcards from beautiful Ukraine. Love this stamp! Hope to get one on a postcard! Congratulations, Ukraine! What a beautiful stamp! I hope to get one on a postcard! What a pretty stamp! Look forward to getting it soon. What a nice stamp. I am looking Forward it to find it on a card. Wonderful! What a beautiful stamp. I really can´t wait to find this on my next card from Ukraine. The stamp is so beautiful! And I also really like the symbolization behind it. I think especially the traditional Ukrainian costume represents the country very well in this stamp, at least I instantly knew which country it is from. How I would love to receive one on a postcard. So colourful and fund. Love the stamp and the envelope! So beautiful !!! Like, Like, Like! It really is so special each time a country creates a stamp for our community! very beautiful design, colorful and friendly. So cute!!!!!!! Love it so much!!!!! Wanna receive one with this stamp!!!! Congrats to all Ukranian Postcrossers!!! Oh I love this stamp! So beautiful- good job! Hope Germany become a postcrossingstamp one day too. What a lovely stamp. Hope to receive one. Great job you did Nataliia. such a cute and beautiful stamp!! Wish the Olympic designs were this pretty! What a fun design! Thanks to those who worked to get this stamp issued. What a beautiful stamp! I love it, that postcrossing get's its own stamps. I'm looking forward to receiving one from Ukraine, it would be lovely. What a beautiful stamp. I look forward to get one on cards from Ukraine. I love the design! Love the peace motif as well! I hope I am sent one! So wonderful and colorful! Love it! Go Ukraine! 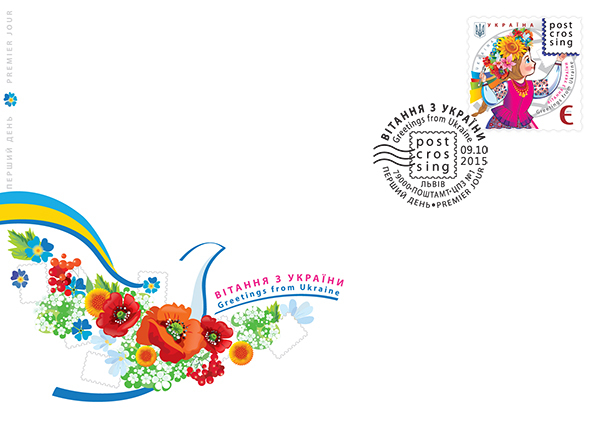 Fantastic stamp from the Ukraine Postal Organisation !!! What a beautiful and colourful stamp, I'm sure Ukraine is very proud of it. I long for the day when I receive a card with this stamp on it. What a beautiful stamp, I hope to receive one. This is a real lovely stamp! Hi! I can send postcard with this stamp 9th October to human,who will send card from his/her country for me too (direct swap). a bright cheery stamp, with an eye-catching national costume as well! Australia Post has just recognized PostCrossing with a big write-up in the September issue of their Stamp Bulletin, which is wonderful! Now we hope they will produce special stamps too. Good Luck to all! Wow! I think this is one of the better Postcrossing stamps! Definitely would love to receive one! P.S. Ищу обмен, нужна чистая украинская марка "Посткроссинг" в коллекцию, на обмен есть марка "Посткроссинг" почты России. Beautiful stamp and first day cover ! Good job, Ukraine post ! Супер! Наконец-то в Украине появилась красивая оригинальна марка! Супер! Нарешті в Україні з'явилася красива оригінальна марка! Super! Finally, in Ukraine appeared beautiful original stamp! It is about time the various country's in the world wake up and get on the peacewagon to save the earth through stamp collecting, production and design. Just look at the new Postxxx stamp being released by Ukraine. WOW! what a beauty! Would be great to know what you think about it, many thanks ! Wow its lovely. Amazing! Beautiful. Very very nice stamp and F.D.C. :)All postcrossers make a big contribute for peace.Let s writing and swapping cards and the weapons scrap. I like it! I collect Ukrainian stamps so I am excited to add it to my collection! One of the most beautiful stamps I´ve ever seen! This is SO beautiful, oh how I would love to have one! What a beautiful stamp and First Day Cover. I hope one finds my mail box. Congratulations Ukraine! Really beautiful stamp! Hope to receive one some day. This is truly a beautiful stamp. Once again congratulations! Very beautiful stamp . I am trying to convince Australian postal offices to adopt a stamp with a Postcrossing theme . Wow! A good idea and a great design! Thanks to Ukraine for a very well done job! Poor Germans - how long must we wait for a stamp ..? Oooh! That's a gorgeous stamp. Also wanted to share a new Canadian stamp that will be released on Sept 28th. It promotes literacy and a love of reading. The nice stamp. I' ll definitely buy these stamps for my postcrosers' friends! Gorgeous! Beautiful colours and a beautiful design. What an amazing stamp. So lovely and bright. I hope to get one soon. Fantastic job Ukraine Postal Service. Nice, very colorful stamp. I made a suggestion to the Belgian Post to make a postcrossing stamp, but it was not withold. How adorable!! Officially on my list of stamps I want to receive!! Lovely stamp. i hope i'll get one. Чудесная марка! Где ее можно будет купить? Кто-то знает? Очень яркая и красивая марка. What a lovely and beautiful stamp! I want to have just one! What a beautiful stamp! If anyone wants to send me a postcard with this stamp on it, I'll be glad to send you a nice card in return!! I've bought it today!!! It is really beautiful! And Happy World Post Day!!! Nice Stamp, so excited to receive it one day ! Very beautiful stamp. Wish to recieve it. Очень красивая марка! Надеюсь получить её на одной из открыток.